I have looked at the help video which essentially describes what I have tried to do above using QGIS - ie. reproject the shapefile into WGS84. Is there something obvious that I am not doing? Perhaps the iTree site needs layers in the Long/Lat geographic coordinate system, EPSG code 4326 (not 3857). EPSG 4326 is geographic and based on WGS84, whereas 3857 is projected also based on WGS84. WGS84 is a datum, not a projection. There are many (hundreds, maybe even thousands)) of projections based on the WGS84 datum. For example there's a whole set of UTM projections which are based on the WGS84 datum. Each with slightly different projection parmmeters. So it's not enough to day "WGS84 projection". Not the answer you're looking for? 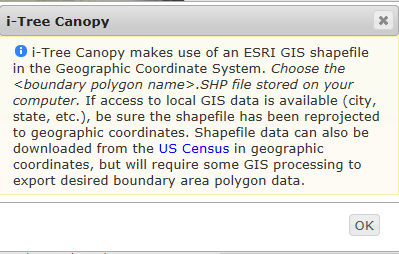 Browse other questions tagged qgis coordinate-system shapefile or ask your own question. How to “hardcode” a shapefile's CRS?